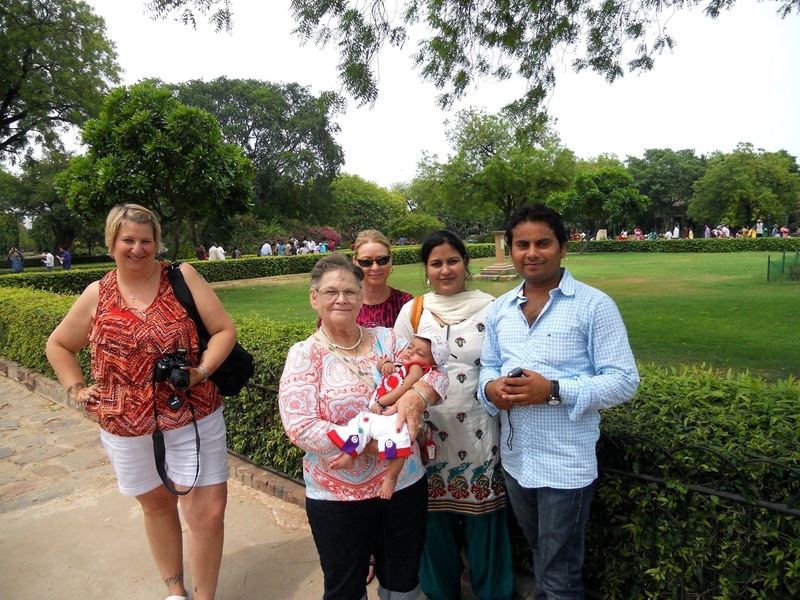 Today I toured Delhi and New Delhi. That’s the first thing I learned: the difference between the two. Nw Delhi is significantly younger than Delhi, being established by the British when they took over. Old Delhi, or just Delhi, is the original part of the city. Generally speaking, I find Delhi to be much different from Mumbai. Yes, there is traffic, but it appears to be less congested. Yes, there are many people, but it seems to feel less crowded. Yes, there is poverty and litter, but the poor people don’t seem to be as obvious as in Mumbai, including less visible slums, less litter, and there are even fewer stray dogs. Delhi does have monkeys, though, which I have not seen in Mumbai. I have decided I like to see monkeys from a distance. We (my father, our tour guide Ashish, and I) had stopped so I could pull some rupees from an ATM. While walking to the ATM, I heard loud screeching and crashing around in the trees above me. I couldn’t place the sound; it didn’t sound like any of the birds I had heard thus far. Suddenly, three monkeys came scrambling down from the trees while many others remained scuttling about in the branches. To say I was stunned would be an understatement. I grabbed my phone to take pictures, entranced. These were wild monkeys, right here in front of me, in the middle of a crowded city. One of the large guys charged toward me, kind of screeching/hissing and baring his teeth. I freaked. I had no idea what to do. Sould I stand still? Should I slowly back away! Should I turn and run? I glanced at Ashish, who also looked somewhat alarmed. He told me to come up the steps by him. I did, but the monkey charged at me again. I ducked behind a wall. I had visions of being attacked by a monkey and having no one know how to stop it. After getting my money from the ATM, I was ale to snap a few more pictures of the monkeys while they were otherwise occupied, but I definitely kept my eyes open, especially in the trees above me, as we walked back to the car. So if I have to tell someone of a unique experience, now I can tell about when I was charged by a monkey in Delhi. Another unique experience was asking to have my picture taken. Multiple times today, Dad, Brenda, Lillian, and I were stopped by Indians, both young and old, asking if they could have their pictures taken with us. We always complied. One family even put their very young baby in Lillian’s arms for a picture. Can you imagine an American stopping a stranger and placing her baby in the arms of that stranger? I finally asked Ashish about this after the 4th time it happened. He explained that we were almost a novelty. These people were from other parts of India and have heard that tourists come to India and have seen images of tourists on television but didn’t know they truly existed. So we were proof and they wanted their pictures taken with us. Many times, they were drawn to Lillian, especially the people with young children. Ashish explained that the elderly bring blessings. It was strange to be stopped by total strangers to have my picture taken with them. It’s even stranger to think these photos might be floating around the Internet and I have no clue where they are at! My final rumination on Delhi comes as a result of visiting the location of Gandhi’s cremation. It is a beautiful site, full of sacredness and peace. I am admittedly ignorant about much related to him. I learned his name was Mohandas but his followers called him Mahatma, which means “great soul”, if I am remembering correctly, which he objected to, but it stuck. Even Ashish referred to him as Mahatma Gandhi. His work started in South Africa when he experienced discrimination personally due to the color of his skin. I am inspired to learn much more about him as a result of what I learned today. Tomorrow I travel to Agra, which used to be the capital of India until Shahjahan moved it to Delhi. In Agra, I will see more of Shahjahan’s legacy when I visit the Taj Mahal.